Weekend is the Ninja Squad's newest snowboard movie. The video is the continuation of the 09/10 Ninja Weekends episodes. It is a series of 9 videos, showing how the Ninja's spend their weekends, driving across the country and filming for their movie. Weekend is all about urban snowboarding, shoot at the cities and away from the snowboard parks/slopes and etc. 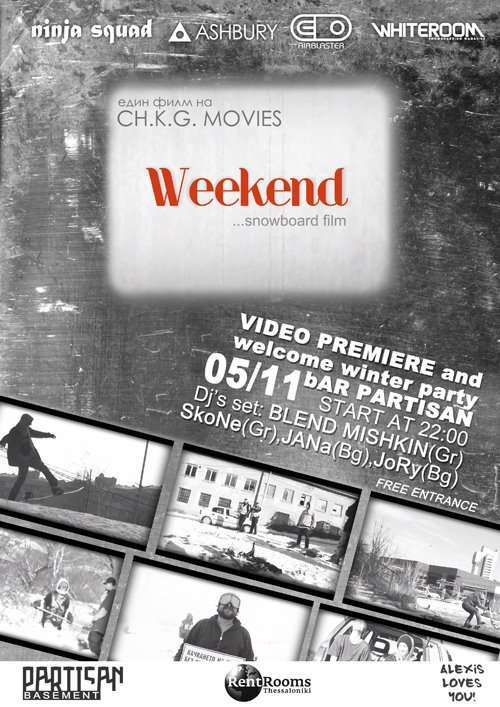 Weekend is the first street only Bulgarian snowboard movie. In addition there is going to be a 'Welcome Winter' party thrown with live music on the decks by Dj's BLEND MISHKIN (Gr), SkoNe (Gr), JoRy (Bg) and JANa (Bg).